Following a 7-day review and conferral with the SFPA Executive Committee, SFPA member Bruce Boston has been suspended for six months from commenting on the Facebook Group and Yahoo Groups listserv for violation of the SFPA Code of Conduct, regarding egregious remarks beginning on July 4th, 2018, and a failure to retract those remarks in a timely manner. He remains a member of the SFPA and retains all honors and titles. This suspension remains in effect until December 31st, 2018. In light of this incident, we wish to share the Code of Conduct, which the Executive Committee created and implemented in July 2017. It was shared on the fora, to which it applies, but was not transmitted to every member and new members may be unaware. Please click on the blue button below to read the document about our expectations of conduct on our forums, Facebook and Yahoo Groups. The rules as well as the consequences for not following them are detailed therein. SFPA Grand Master Bruce Boston, in comments on a SFPA Facebook group post about the Rhysling winners, publicly insinuated that 2018 short poem Rhysling winner, Mary Soon Lee, must have been the beneficiary of vote stuffing because in his view her poem was unworthy of the honor. As of this writing, Boston’s and others’ comments are still accessible by nonmembers of the group. Here is a screenshot from near the beginning of the exchange. (2) W76 BUSINESS MEETING SCHEDULE. On his blog, Kevin Standlee previewed his Worldcon article – “Business Meeting & Site Selection Schedules at Worldcon 76”. For those of you trying to arrange your schedule for Worldcon 76 around the WSFS Business Meeting and Site Selection (as I am rather forced to do by the nature of running the WSFS division), here’s the current state of our plans. For those of you who are veterans of the process, this may all sound boring, repetitive, and obvious, but based on the questions I’ve fielded, there are members — including people interested in WSFS Business — who do not know this stuff. Linda Deneroff also has posted the start of the agenda for Worldcon 76. You can find it on the Business Meeting page. Click on the “Agenda” link. Imagine checking into a hotel and handing your luggage to a bellhop, but not seeing another human besides other guests. That’s the reality at Henn Na Hotel in Japan’s Nagasaki Prefecture, where robots have taken over. Robot enthusiast Grant Imaharavisits the hotel to see how the hospitality business can succeed without humans. During his stay, Grant is surprised by the non-humanoid robot he meets at the check-in desk. Maybe he should have known—Henn Na Hotel loosely translates to “strange hotel” in Japanese. Naomi Tomita, the hotel’s Chief Technology Officer, says that using non-humanoid robots can make the interactions less awkward. The hotel encourages guests to chat with the robots while they work. A robot checks Grant’s coat, and a robotic trolley takes his luggage to his hotel room. (4) MORE FROM BODLEIAN. Nicholas Whyte tweeted an image from the Bodleian’s Tolkien exhibition. (5) MOVIE POSTER AUCTION. Heritage Auctions told subscribers that sf movie posters will be featured in its forthcoming Movie Posters Auction July 28-29 in Dallas. A Star Trek poster by illustrator Bob Peak is expected to compete for top-lot honors. 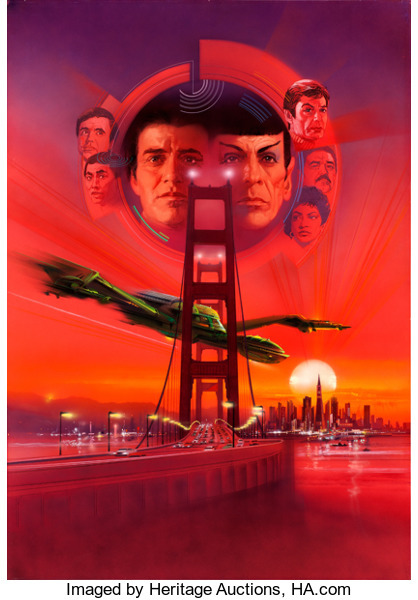 Star Trek IV: The Voyage Home by Bob Peak (Paramount, 1987) (est. $40,000-80,000) is the largest and arguably the most detailed of all Star Trek posters designed by Peak. A renowned commercial artist whose greatest acclaim comes from his developments in the design of modern movie posters, Peak’s artwork has appeared on the cover of numerous magazines, including Time, TV Guide and Sports Illustrated . The brilliant color used for the evening sky of San Francisco offers stark contrast to the Klingon Bird of Prey flying just over the Golden Gate Bridge. The 40-by-57-1/2-inch poster is done on illustration board mounted on foamcore, is signed by Peak and comes with a gold frame. Science fiction fans also will be drawn to The War of the Worlds (Paramount, 1953). Half Sheet (22″ X 28″) Style B (est. $20,000-40,000), a rare Style B half sheet that is one of the most iconic and elusive images in the genre. Featuring Martian warship imagery not included in many other posters for the original release of George Pal’s powerful adaptation of H.G. Wells’ science fiction novel. 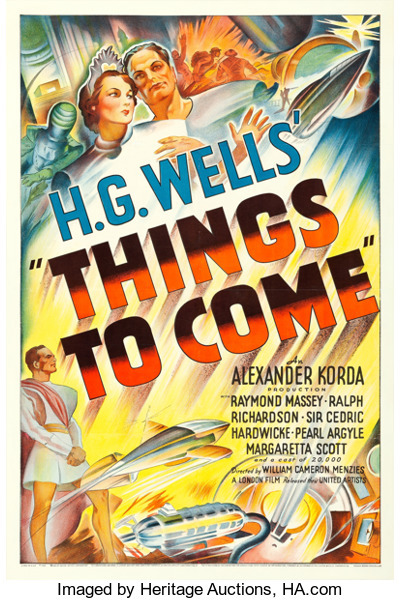 …Widely considered to be among the greatest film posters of all time, a Things to Come (United Artists, 1936) one sheet (est. $15,000-30,000) was inspired by another science fiction film based on another H.G. Wells-inspired screenplay. The film is based on his 1933 novel The Shape of Things to Come and his 1931 non-fiction The Work, Wealth and Happiness of Mankind. Among the always-rare posters for this early sci-fi epic, this one stands out in part because of the 1930s deco-designed version of the future. (6) RECORD SETTING. Seattle’s Sub Pop Records is taking preorders on Bandcamp for The Rick And Morty Soundtrack, a 26-track collection of music from the animated series on Cartoon Network. Two vinyl LP packages (“Deluxe” and “Loser”) and a digital version are available. 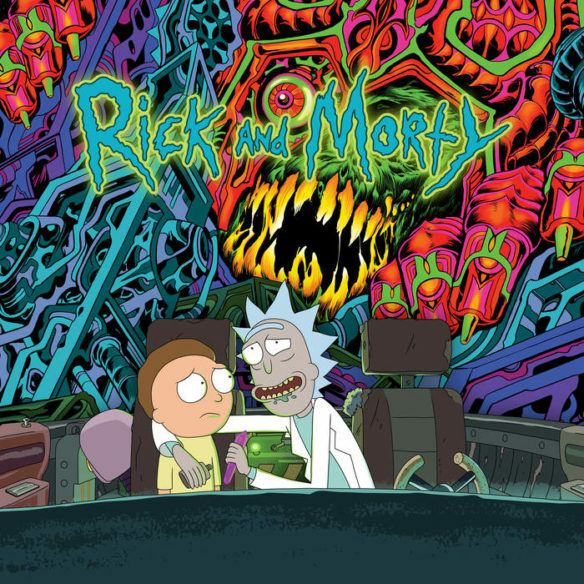 This release is the first official collection of music from Rick and Morty. All formats feature 26 songs, 24 of which are from the first 3 seasons of the show, and 18 of which were composed by Ryan Elder specifically for the show. The album also includes songs by Mazzy Star, Chaos Chaos, Blonde Redhead, and Belly, all of which have been featured in the show, as well as two new tunes from Chad VanGaalen and Clipping inspired by the show. The box set includes a special bonus track on a 7”. Alan Johnson, a choreographer renowned for his campy movie collaborations with Mel Brooks on the “Springtime for Hitler” goose-steppers-and-showgirls extravaganza in “The Producers” and the “Puttin’ On the Ritz” tap dance in “Young Frankenstein,” died on Saturday at his home in Los Angeles. He was 81. Mr. Johnson had danced in the original Broadway production of “West Side Story” and begun his career as a choreographer when he started working with Mr. Brooks, whom he had already met through a friend, the lyricist Martin Charnin. Mr. Brooks, best known at the time for his work with Carl Reiner on the “2000 Year Old Man” records, was developing “The Producers,” about a producer who schemes with his accountant to create a certain Broadway flop and steal the money invested in it by unsuspecting old women. …In his role as producer, Mr. Brooks gave Mr. Johnson the chance to direct two films. The first, “To Be or Not to Be” (1983), was a remake of Ernst Lubitsch’s 1942 comedy with Mr. Brooks and Ms. Bancroft in the roles played in the original by Jack Benny and Carole Lombard. Three years later Mr. Johnson directed “Solarbabies” (1986), a science-fiction story about roller-skating orphans fighting for a solution to a worldwide water shortage. It was widely panned. That’s some potion in Bizarro. Frazz asks how a reader can like wildly disparate writers. Bliss contains a space navigation tip. (10) MOVIE AD ADAPTATIONS. These cat pictures may not display properly here, however, they are certainly worth clicking through to see. (11) ANCIENT MONUMENT. Science journal Nature covers the “Mystery of buried children at German ‘Stonehenge’”. Scientists scrutinize monumental complex of ditches and posts built more than 4,000 years ago. (12) GRIST FOR THE MILL. Sean T. Collins argues “The only good online fandom left is Dune” at The Outline. (13) WHERE ROCKS WERE BANGED TOGETHER. BBC summarizes an item from Nature: “Earliest evidence of humans outside Africa”. Scientists say they’ve found the earliest known evidence of a human presence outside Africa. Stone tools discovered in China suggest primitive humans – or a close relative – were in the region as early as 2.12 million years ago. (14) HOO-RAY. A Gizmodo writer is overwhelmed: “The World’s First Full-Color, 3D X-rays Are Freaking Me Out”. A New Zealand company called Mars Bioimaging has developed a new type of medical imaging scanner that works in a similar fashion, but borrows technology developed for the Large Hadron Collider at CERN to produce far more detailed results. The Medipix3 chip works similar to the sensor in your digital camera, but it detects and counts the particles hitting each pixel when a shutter opens…. It will be years before the new Spectral CT scanner receives all the clearances and approvals it needs so that it can be used in hospitals and clinics. But it’s well past the research stages at this point, and clinical trials are expected to get underway in New Zealand in the coming months. So (posits Daniel Dern), it’s no longer too dark inside a dog to read? (15) ACTION FIGURE REVIVAL. SYFY Wire makes note of several new lines of action figures coming soon from a company known for them in the 70’s and 80’s (“Mego toys is staging a comeback with new line of action figures from DC, Star Trek, and more”). 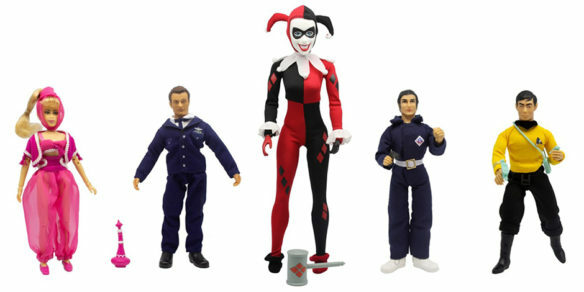 The figures will be exclusive to Target and are being debuted at San Diego Comic-Con. They’ll appear in stores a little later this year. Ready for a blast from the past? Toymaker Mego and industry legend Marty Abrams, co-founder and CEO of Mego Corporation, are recreating the company’s famous action figure line, and Target will be the exclusive retailer. The new line of collectibles hits stores and Target.com July 29, but fans will get a first look next week during a panel at San Diego Comic-Con—one of the largest gatherings of comic, movie and science fiction fans in the world…. Target’s exclusive line of Mego collectibles will be available in stores and online July 29 at prices ranging from $14.99 to $29.99. Check out our full assortment of collectibles at Target stores nationwide and Target.com.